Sara please can you contact Roman Diaz to make a video on this awsome fox on the cover? Please I fell in love with it just like you and the cardinal please please!!!!!!!!!!!!!!!!!!!!!!!!!!!!!!!!!!!!!!!!!!!! hi sara i tried to contact whith román díaz but i can't! seeing you contact him , i ask to you : how? Sorry, I do not pass on contact details. This is true not just for origami designers, but especially for them. If you have a message for Roman Diaz, you can send it to me, and if it is formulated respectfully, I can pass it on to him. Roman Diaz can than choose to respond to that message in his own time. If I'm not mistaken, the simpler models have a suggestion of 10 to 15 to 20cm. The more advanced models have a recommendation of 25cm to 40cm, and the most complex model asks for a 50cm square. The more advanced models I have folded from this book, I always folded from tissue foil, which I bought at origami-shop.com. However, I'm sure you could fold these from other paper, such as normal kami, tant, and - at least the roc - from double tissue. Come to think of it, I actually did use kami (e.g. 35cm squares from origami-shop.com) for the first folds of some of the more advanced models, and also in the video for the vixen. 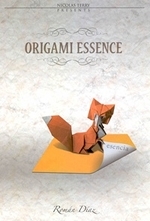 Origami-shop is based in Europe, so their main currency is Euro. But if you look in the top left corner, you'll see a selector for displaying other currencies. This includes US Dollars. How do you buy his book? And in his book, is there instructions on how to make these animals?